The Volvo 700 series was an executive class sedan/wagon built as a replacement for the aging 200 series, but it was actually outlasted by its younger brother. The 700 was eventually morphed into the 900 series which was the end of the line for Volvo's rear-drive family cars. What this means today is the 760/740 is a great candidate for all kinds of V8 swaps and today's blue sedan is no exception. 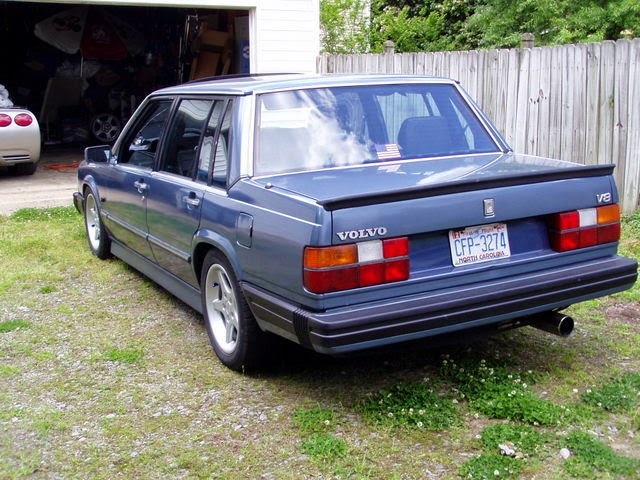 Find this 1983 Volvo 760 with V8 Swap here on eBay offered for $8,900 buy-it-now or make-offer located in Cary, NC with 6 days to go. This Volvo has gone under the car customizer's knife but it doesn't look like a barnyard hack job. The seller claims that the engine/trans/ECM was taken from a Chevrolet Camaro Z28 and everything works as it should, including the check engine light. The only thing missing for emissions compliance is a catalyst and whatever certification process is necessary in your neck of the woods. Pop the hood and you'll be greeted with a 5.7 liter Chevrolet LT1 V8 from a 1993 Camaro mated to a 6-speed manual gearbox. The LT1 pushes out 275 horsepower and 325 ft-lbs of torque when new, but you could expect a few more with a free flowing exhaust. The swap was done about 10 years ago, but it allegedly hasn't seen many miles since the engine, transmission, diff, suspension, fuel lines, brake lines, and steering rack were replaced. The A/C apparently works and the Recaro driver's seat should make it a comfortable cruiser for daily driving needs. Freakin' sweet. Not sure about the side skirts, or the rollin' on the bump stops front end (probably needs a set of diesel springs to de-stance-ify it) but I'm loving the e-code headlights and clear corners, 740 turbo grille, and the 6-spd manual trans (hope I didn't offend anyone) V8 combo. For around town / occasional trackday that Recaro is probably awesome, but having put close to a half million miles on 700/900 series Volvo seats I can confirm they're pretty well suited to the task of long distance cruising sans fatigue. 225/50's with that much of a drop in the front must seriously limit this car's turning radius though, so I'd probably stick to 205/50's in the front and something slightly fatter out back (that rear wheel well is pretty narrow on these cars though). Addendum: those look like smoked S**b 900 side markers. Having grafted a set onto one of my 700 series cars back in high school, I know they fit. The Volvo factory side markers are more boxy (but good) looking vs the sleek, rounded-ness of the S**b units. Anyone with a better set of eyes want to confirm? Looks like everything about the engine swap is right, and most of the rest is not all that. No shiny braided hoses. No K&N cone air filter (the most obvious evidence of the lazy way out.) All good. But yeah, the skirts, the stance, Don't like low and it could use more tire. If I was starting from scratch - not fond of the 700 sedans, the roofline looks like someone started with a wagon and notched it to make a sedan. And we're almost twenty years down the road with aluminum LSn-family motors, so the old smallblock might as well be a 259 Merc flathead for a swap like this as far as I'm concerned. Still, this might work really well if the suspension's sorted. I wonder if these go up for sale right about the time they need spark plugs...and the owner discovers that the engine has to be pulled? Pffft, looks like plenty of room to change the plugs... from underneath.. if you drop the exh manifolds... and have the dexterity and hand size of a female gymnast. haha. Yeah, it looks tighter than, say, a GM pickup but no worse than many OE V8 applications. Sigh: Another ABC (Anywhere But California) car. This thing looks sweet, but getting it registered here in the Gp;den State would be nearly impossible. Wouldn't it be more correct to say it was outlasted by it's older brother?